Fabric Lifting Door, with cross beams between PVC tarps, can be vertically lifted. According to the actual situation that there are layers on the ceiling, column guide rails were used to solve this problem. The door was installed in the inner part of the opening and the fabric were lifted to the upper side when opened, which takes up less room. It is composed of doorframe, guiding track, motive track (optional), door fabric, wind-resisting cross beams, beam frame, bottom beam, sealing system, driving system, transmitting system, safety system, automatic system. 4. Rational layout can be designed according to different layer of the building; advance structural design assures the maximum heat preservation. 5. The thickness can be designed according to different surroundings, sturdy and durable, high shock resistance performance. 6. 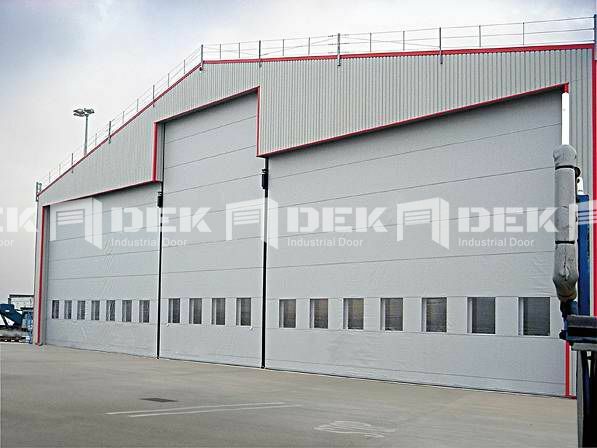 Industrial door fabric is coated with PVC, which has a good performance of anti-solarization, rain and snow proof, sound absorption, noise reduction, flame retardant, heat preserving, gas defense, moisture proof, etc. 7. Higher safety parameter, with fall-arrest mechanism. 8. Easily installation and highly adaptable. 5. Wind-resisting capacity: wind pressure requirement can be designed according to the local climate and customer’s request. Well fit into openings that are long-span and super high, openings with the top shape like ladder and openings with narrow space on top, which take up neither inside nor outside space. It is especially fit for steel plant, smelter, metal processing plant, mining, blasting and painting shed, recycling plant, garbage processing base, shipyard, airship yard, paper mill, irrigation works, craneway and hangars, where is damp, extremely cold, strong wind pressure and dusty.